The practice of meditation has become widely accepted in Western society as a way to reduce stress. Health-care professionals routinely recommend meditation for patients suffering from tension headaches, anxiety, insomnia, and other stress-related conditions. Research shows that daily meditation practice benefits the body by helping to lower cortisol levels in the blood. This reduces stress in the body, lowering the risk for many health problems. The ability to relax deeply has become increasingly difficult in a world where people’s lives are overburdened with work, exposure to technology and social media, and other societal pressures. The evidence for health problems associated with stress is piling up. One impact of stress is change in sleep patterns, usually experienced as a problem getting to sleep and staying asleep through the night. Once the ability to get a good night’s sleep becomes chronic, it can be difficult for the insomniac to operate during the day. Performance at work may suffer, along with the ability to enjoy life outside work. Committing 20-25 minutes each day to the practice of meditation can help most insomniacs break the cycle of sleeplessness. Their ability to relax increases, they are better able to let go of anxious thoughts, and regular patterns of sleep can be restored. 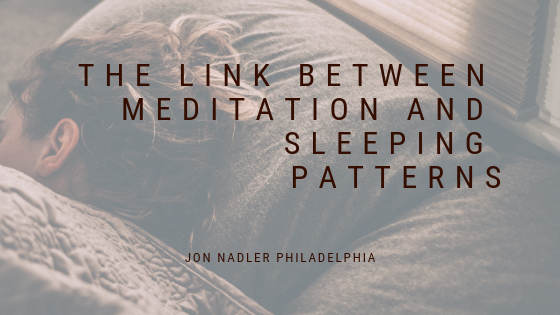 People with insomnia often prefer to meditate in the evening. Sleep comes more easily as the mind begins to quiet, breathing and heartbeat rates gradually slow down, and blood pressure drops, diminishing the level of stress hormones in the blood. Loose clothing, a dedicated cushion or chair, and an upright, but relaxed, sitting posture is recommended for all meditation practices. In terms of meditation techniques, most people try several before settling on one they can stick with over time. Mindfulness meditation tends to focus on some aspect of the breathing. Concentration meditation has the practitioner repeat a mantra, or focus on an object, such as, a candle flame. Some people prefer guided meditation, which often uses imagery to calm the mind. There are many resources available for anyone wanting to begin a meditation practice. Each of the different meditation techniques is designed to help the meditator stay in the moment, moving away from daily worries and distractions, which can be a valuable tool in managing the challenges of today’s world.